Litter is not only unsightly, it can degrade the quality of our drinking water as well as endanger marine and wildlife habitat. 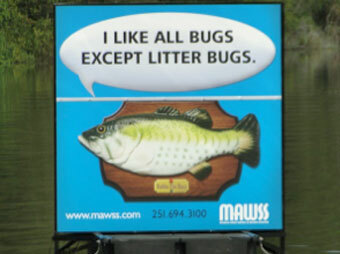 MAWSS works closely with the Mobile County Sheriff’s Department to enforce litter laws on all land that drains into Big Creek Lake. 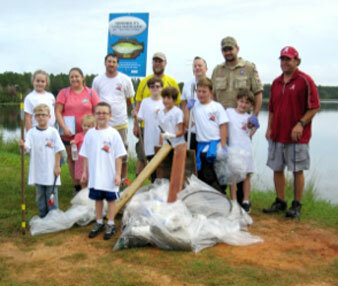 MAWSS is a proud sponsor and participant in the annual Alabama Coastal Cleanup that occurs the third weekend in September. The litter cleanup is the largest one day volunteer event in the state. It brings hundreds of scouts, students and families, as well as MAWSS employees to the Lake to support clean water. Similar events occur simultaneously along coastlines in Mobile and Baldwin counties. For more information or to volunteer, visit www.alabamacoastalcleanup.com. Signs are posted at Big Creek Lake to discourage littering.